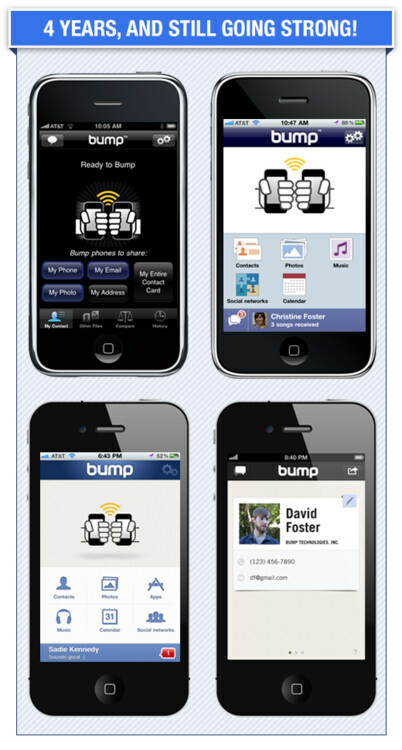 A magical app in the early of the iPhone called Bump gave us the ability to bump two iPhones together and transfer contact information. It was a nifty solution to handle the lack of IR transfer between devices that earlier PDAs had. After a while, the app advanced to more things to bump transfer between phones, the most popular in my circles was photos. The bump action was basically a moment in time that the app could use to match the two phones together then wirelessly transfer what was being asked of it. Photo transfer didn’t require a Web site, social app, or anything more than two people with their phones, the app, the photo and the desire to share. The company producing Bump offered methods for other developers to use their technology in their apps to transfer information beyond what the Bump app did. The group also created a social photo sharing service called Flock. 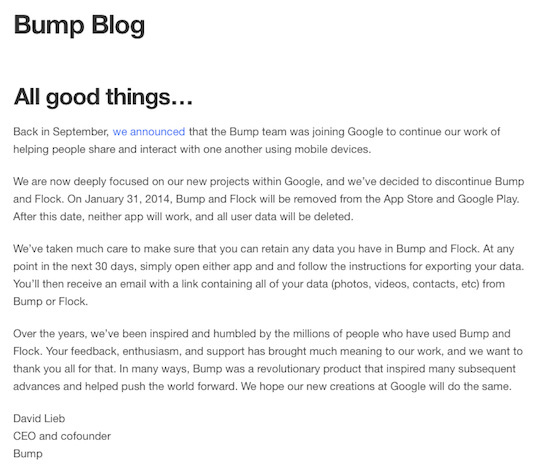 Last September, 2013, Bump announced they had been purchased by Google. No claims where made, but the hope had been that we would find the Bump action in the many other Google offerings. Naturally, Google would want that additional data point of the phones and files transferred. Sadly, they didn’t agree with this thinking and according to the Bump Web site, the app is being taken down and service will be End-of-Lifed on January 31, 2014. I can imagine the horror a developer that was using that technology in their app is going through right now. Like the many other photo sharing/storing solutions that have gone away over the last year, this just adds to the concern about becoming dependent on any service, if they are not making the cash flow they need to, you loose too.